Have you tried frexting yet? In a special gesture, the UN Chief visited the Permanent Mission of India to the UN here yesterday to sign the condolence book placed following the death of the 11th President of India and an accomplished scientist. NEW YORK: Describing former President A P J Abdul Kalam as a "great statesman", UN secretary-general Ban Ki-moon has said that the outpouring of grief around the world following his death is a testament of the respect and inspiration he has garnered during and after his Presidency. In a special gesture, the UN chief visited the Permanent Mission of India to the UN here on Friday to sign the condolence book placed following the death of the 11th President of India and an accomplished scientist. The book has been open over the last couple of days to Ambassadors of all member state to express their condolences. 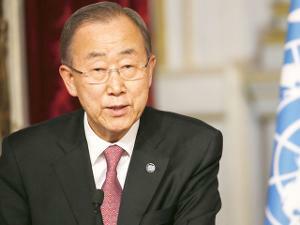 Ban expressed his deepest condolences on the passing of the former Indian President in his message. "The outpouring of grief around the world is a testament of the respect and inspiration he has garnered during and after his presidency. The UN joins the people of India in sending our deepest condolences for this great statesman. May he rest in peace and eternity," Ban said in his message. Kalam died on July 27 following a cardiac arrest at the age of 83. He was in Shillong to deliver a lecture at the prestigious IIM and collapsed on stage just a few minutes into his speech. The UN Secretary-General has said that the outpouring of grief around the world following his death is a testament of the respect for Kalam.